I went to my friend’s most favorite ramen shop in Chiba the other day. The shop is named “Ajidokoro Musashino” that stands in Kamihongo. We took about 15 minutes walk from Minoridai station (Shin-Keisei Line). It never seems ramen shop from its appearance. 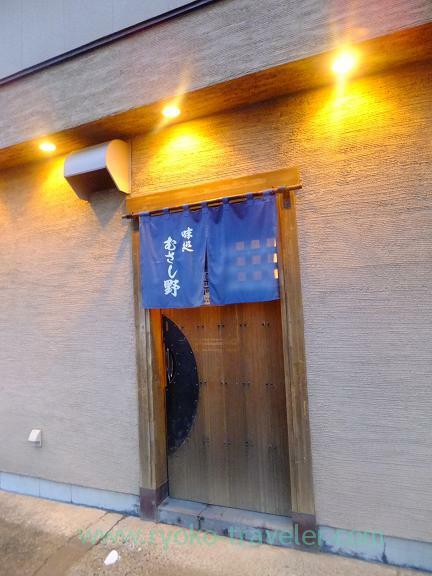 It looks like nice Japanese cuisine restaurant. 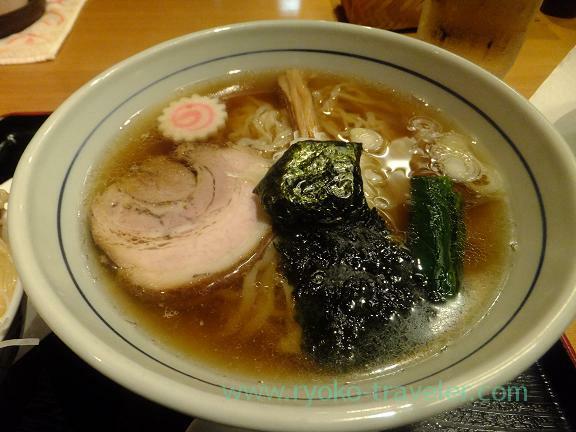 Now, it is most popular ramen shop in Chiba. We arrived at the shop about 10 minutes before the shop open, but there were already three persons waiting in front of the door. Also the interior was elegant. 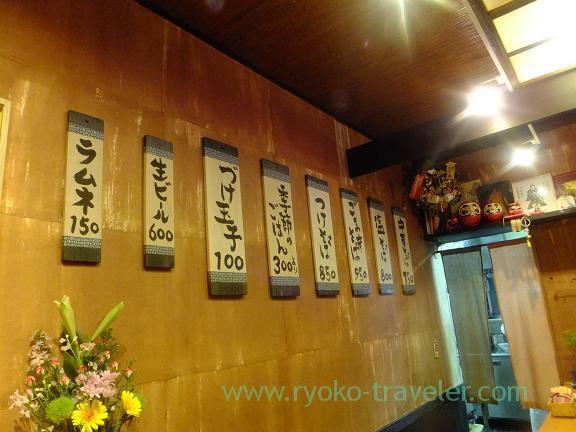 Menus were on the wall. That’s all. There is no ticket vending machines. We ordered after being seated and we paid when we left. We can have meal with relax. It is very nice. It is seasonal rice bowl. 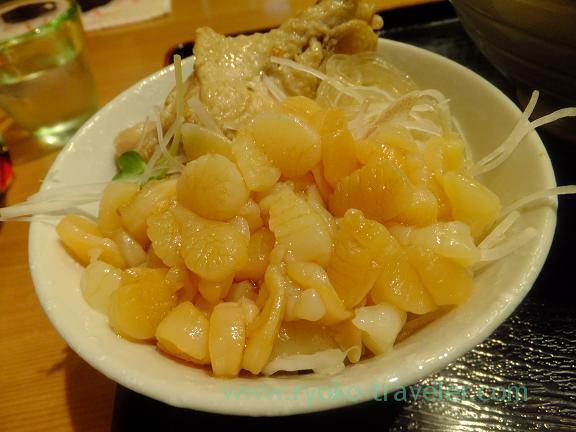 Arch shell ligaments sashimi, fried chicken wing stick and cellophane noodles was on snow crab takikomi gohan. You can’t order only it. You have to order with noodles. Tha soy sauce and sugar taste was soaked in the wing stick and cellophane noodles well. And chinese noodles. It looks elegant. Transparent soy sauce soup. I felt the good taste of fish. Homemade curly noodles. It was similar to kishimen. It is my friend’s “Tsuke soba (つけそば, 850 yen). 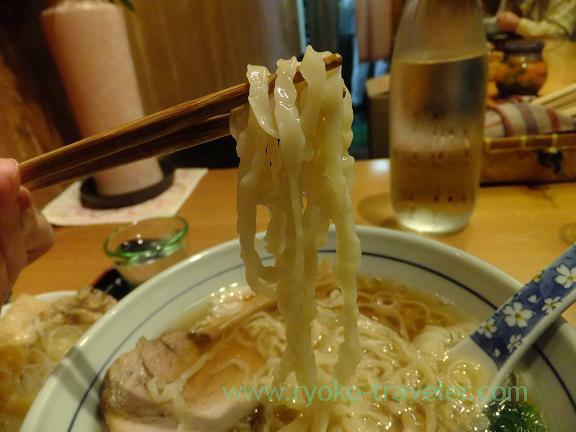 It is tsukemen.The ingredients were well dished up on the bamboo basket.